Canada is a good place for skilled professionals. This is a country which provides plenty of opportunities for career growth. This is also a place where one can study in some of the best universities. There are some really good study courses offered by Canadian universities. The lifestyle and quality of life being a good many people apply for the Permanent resident visa. Canada permanent residents are given plenty of benefits. This means that can work study and live anywhere in Canada. They get medical and social benefits just like the people who have Canada citizenship. PRs also get protection under Canadian law. They can apply for the citizenship of Canada after a stay of a short period in the country. Since PRs are getting so many benefits naturally the authorities will want them also to follow certain rules and regulations. Hence, PR visa holders must be law-abiding, failing which they can be in serious repercussions. There are many things that can lead to loss of permanent resident status. Involvement in criminal activity or hiding a criminal activity, faking of identity or lying about physical presence in Canada can all result in loss of PR status. It is important that at the time of applying the candidate gives all the correct information. The candidate must not give any fake information or fake papers. It must be noted that if it is found that the person has tried to get the visa by providing fake documents or has lied even then it can result in loss of PR status. If at any point in time the government finds that the person can be the potential threat to the country then it can lead to the cancellation of the visa. What did the permanent residents need to do? The permanent residents need to always speak the truth and follow all the rules and regulations. They should never get involved in any activity that can result in any damage to the country. It is important that they understand that since they are getting so many benefits it is important that they do not misuse their rights. They also need to understand that their failure to abide by rules and regulations can lead them to tough circumstances in the country and even exit from the country. You can lose your job, your reputation can get tarnished and you will also lose your permanent resident status. In some cases, it has been found that the candidate does not get proper guidance. The immigration consultants may not be reliable. The candidate will end up paying a heavy price for the same. It is therefore important to opt for only trusted immigration consultants. 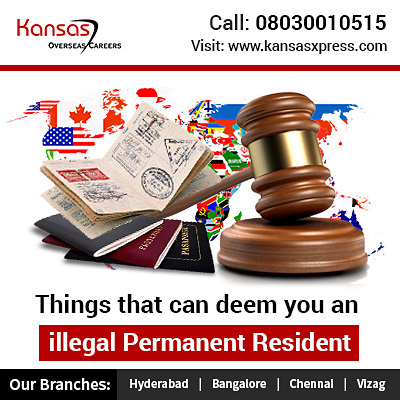 Kansas Overseas Careers is one of the most reputed and trusted names in the immigration and visa industry. If you need guidance on the immigration laws of Canada then you must approach us. We shall provide you with all the correct information.